New rules governing the personal data of passengers flying to the United States from Europe are set to take effect, and Congress is poised to pass a new law governing the visa requirements of visitors that has already caused dissention among some allies. The U.S. and the European Union signed an agreement Thursday that reduces the amount of information provided U.S. authorities about airline passengers before they arrive from Europe. It replaces an interim agreement that was to have expired next week. That pact gave the U.S. access to 34 pieces of identifying information about arriving passengers, to be archived for 3½ years. The European Union's highest court had ruled in May 2006 that the then-current rule compelling European airlines to turn over passenger data was created illegally and forced a new deal. European critics had protested earlier rules as an invasion of privacy and sought to narrow the personal data "pushed" to the U.S. The new deal limits covers 19 pieces of data, including passenger names, addresses, seat numbers, credit card information and travel details. 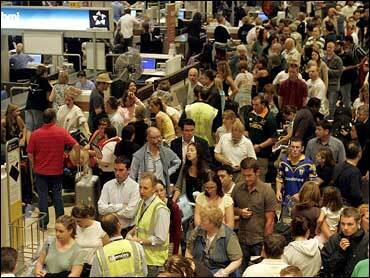 The information is to be provided within 15 minutes of a flight's departure for the U.S. The data can be kept for seven years in an active file, then for eight more years in a dormant file accessible for specific, limited uses. While the agreement limits the passenger data accessed, and mandates other identifying information, such as meal choices, be filtered, it also allows Homeland Security to access sensitive information "in an exceptional case where the life of a data subject or of others could be imperiled or seriously impaired." DHS is required to log such access and notify the European Commission within 48 hours. The new system will be in effect by January 1, 2008. Homeland Security Secretary Michael Chertoff described the information-sharing pact as "an essential screening tool for detecting potentially dangerous trans-Atlantic travelers." In his statement, Chertoff cited a lack of information-sharing on Sept. 11, 2001, when terrorists struck the U.S. with hijacked planes. "Our front-line personnel did not have this tool on September 11th," Chertoff said. "Investigations after the attacks showed that PNR (passenger name record) data would have, within a matter of moments, helped to identify many of the 19 hijackers by linking their methods of payment, phone numbers and seat assignments." Meanwhile, Congress is close to approving legislation to expand a program that allows citizens of some countries to travel to the United States without visas. Nationals of several close allies, including some with troops in Iraq or Afghanistan, appear to be excluded. The outline of the visa program began to take shape in a security bill agreed upon Wednesday by negotiators from the House of Representatives and the Senate. The Senate approved it late Thursday, and the House was expected to pass the bill as early as Friday, sending it to the president to sign into law. In many of the new EU countries whose citizens still would require visas, inclusion in the visa-waiver program has become a sensitive political issue and a subject of intense diplomatic discussion with the United States. Many NATO members have complained that their support of U.S. operations in Iraq and Afghanistan has not won them entry into the program. Polish President Lech Kaczynski raised the issue with Mr. Bush during a visit to the White House. The administration has expressed support for a limited expansion of the program as a way to reward allies. The bill moving for final legislative action would make it difficult for many other countries to qualify by setting technical requirements based on the number of a country's citizens who have been denied visas or exceeded their legal stays in the United States. One provision requires that countries demonstrate that fewer than 10 percent of recent applicants for U.S. visas have been denied. According to State Department statistics for the first six months of this year provided by the office of Sen. Joe Lieberman, I-Conn., who chaired the negotiations on the final bill, countries including Romania, Poland, Lithuania, Latvia, Slovakia and Hungary would not qualify. Most of those countries come in close to the 10 percent requirement, but Poland and Romania had more than 25 percent of their applicants rejected. The Czech Republic and Estonia currently would meet the requirement, as would South Korea, which also has made clear it wanted to join the program. On Thursday, Poland expressed disappointment that the legislation would not allow its immediate entry into the program. "We will continue our campaign to convince members of the U.S. Congress that including Poland into the visa waiver program would strengthen security of the United States, would enhance the security of travelers and would strengthen political and cultural ties between the United States and Central European countries," said the press attaché in the Polish Embassy in Washington, Pawel Maciag. Earlier drafts of the legislation that would have made it easier for countries to qualify foundered on opposition from some lawmakers worried about insecure borders and illegal immigration. Congressional aides say that the bill allows for some flexibility. Countries seeking entry must demonstrate their eligibility to the U.S. Department of Homeland Security. Aides said that if the countries demonstrate eligibility over time by implementing stricter policies to monitor their citizens' travel to the United States, they could be added. Senator George Voinovich, R-Ohio, an advocate of expanding the program, said the legislation would allow many more countries to join eventually. "I believe it may only be a matter of time until all of our allies are brought into this new program, once everyone sees this is a more secure and efficient system for promoting travel and business," he said.